Berggruen Gallery is pleased to present an exhibition of new works by Sam Messenger on view November 2 through December 23, 2017. The gallery is proud to host Messenger’s first exhibition of works on the West Coast, as well as the artist’s first solo exhibition at Berggruen. A reception for the artist will be held on Thursday, November 2 from 5:00 to 8:00pm. This exhibition features a selection of works on paper created throughout 2017 and paintings from 2014. Messenger’s recent works demonstrate the artist’s continuing engagement with intricate, geometric patterns that convey a sense of materiality and an illusion of depth through their interlacing, web-like designs. The tactile dimension of Messenger’s works reflects the artist’s meticulous handling of ink and pigment on paper - a manual technique that harkens back to his early training in graphic design, technical drawing, and printing practices. Messenger’s intensive, rules-based craft unfolds in the formation of grids drawn carefully by hand. This process involves using a straightedge to draw parallel lines, which he then carefully rotates to create depth and movement where the lines intersect. Messenger’s labor-intensive technique recalls his captivation with compass-and-straightedge designs as well as his early study of Fibonacci numbers and the golden ratio. Throughout his artistic career, Messenger has balanced his penchant for geometric precision with an approach to art-making that relies on natural processes and a degree of uncertainty. The artist continually returns to ephemeral and natural resources in his work, incorporating organic materials such as rain or snow throughout his practice. For example, Messenger has experimented with priming his paper by soaking sheets in the river before placing them onto snow. He then washes over the paper with black ink, combining natural and synthetic forms of liquid to saturate the original material. As this exhibition demonstrates, embedded in Messenger’s art is a kinetic energy shaped by his exacting craft. To achieve a visual appearance of texture, Messenger experiments with the organic capabilities of his medium while addressing formal considerations such as tone, contour, and structure. Messenger’s artistic practice derives from a meticulous process of creation grounded in mathematical principles, yet the hand of the artist emerges in subtle distortions and idiosyncrasies across his work. 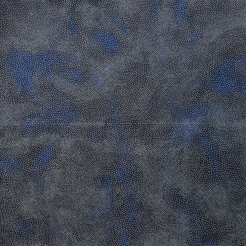 He masterfully alters his color palette to create the illusion of cloud-like forms or soft ripples of water blanketed by a gossamer, web-like façade, while shifts in the texture, intensity, and spacing of the drawn or painted lines interrupt the patterns of his grid-like compositions, allowing the works to express a capricious and even sculptural dimensionality. The subtlety of these delicate transitions imbues Messenger’s work with a natural ease. The mathematical framework of the artist’s mark-making recalls the structural harmony and order of Minimalist art, yet the ebb and flow of Messenger’s layered compositions proposes a coalescence between the organic qualities of his medium and his penchant for geometric precision. Planes of linear repetition swell and contract to create a fluid rhythm of spherical forms with a fibrous delicacy. This delicacy occurs as a result of layers upon layers of mark-making - a time-intensive technique that Messenger has developed throughout his career, yet no two works are identical. An element of unpredictability permeates the artist’s works, and throughout the layering process his compositions take shape without following a rigorous pattern or fixed plan. What Messenger thus brings forth is a probing of his medium’s potential - an exploration of the optical possibilities of ink and pigment through a unique visual language that he continues to expand with each of his striking designs. Sam Messenger was born in London, England in 1980. He received his M.A. at the Royal College of Art, where he earned the Parallel Prize in 2005. Messenger’s work has been exhibited internationally at institutions such as the Museum of Fine Arts, Houston; the Courtauld Institute of Art, London; the Pennsylvania Academy of the Fine Arts, Philadelphia; and the Norton Museum of Art, West Palm Beach. Messenger’s art is also featured in numerous public and private collections, including the Williams College Museum of Art, Williamstown; Museum of Art Rhode Island School of Design, Providence; and Museum of Fine Arts, Houston. Messenger lives and works in London. Sam Messenger, November 2 – December 23. On view at 10 Hawthorne Street, San Francisco, CA 94105. Images and preview are available upon request. For all inquiries, please contact the gallery by phone (415)781-4629 or email info@berggruen.com.